I really wanted to write this post because I feel it is the perfect time of year to work on self-care. I know many of you may feel guilty for putting yourself first and spending time looking after you but it is so important. It’s time to make self-care a priority and add it into your life daily. Self-care isn’t always about having a bath, lighting candles or painting your nails. It can be essential habits that will improve your health and mindset. 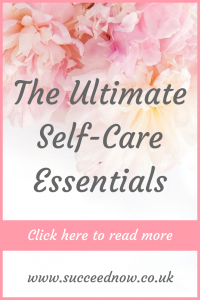 Here are some simple self-care essentials that you may not have thought of before as self-care but will massively contribute to your physical and mental health. This one is so easy to overlook but it is so important. Drinking water has so many amazing benefits for your physical and mental health. I always start my day drinking water and drink about 2 litres a day. Water is a great way to feel refreshed and energised. As much as you feel caffeine gives you the same feeling, it doesn’t have many positive effects on your physical or mental health. I haven’t had tea, coffee or fizzy drinks for years, since my counsellor said about caffeine triggering anxiety. I feel so much better for it. This is another one that it is easy to miss the importance of. A regular sleep routine will really help your physical and mental health and give you the energy you need. I tend to sleep between 10 and 6 or 7. Obviously holidays and other occasions impact this every now and then but it is consistent most of the time and has become habit. Set yourself a time to go to sleep and wake up and stick to it for weekdays and weekends. Next create a sleep routine, I recommend no phone or technology for the last 30 minutes of the day. During this sleep routine you could meditate, journal, colour or do anything else that helps you to relax and wind down ready to sleep. Make the effort to move everyday. No matter how little this movement is it will have a positive impact on your physical and mental health. I’m currently trying yoga and am really enjoying that (beginners yoga routine) it can be as simple as walking up and down the stairs, walking in your local area or doing some exercise that doesn’t need equipment (sit ups, lunges, squats etc). There are so many workout ideas on Pinterest that will help you get started. This is a great way to grow yourself and learn new things which is a great way to look after yourself. Reading is a great relaxing activity so is an amazing self-care habit. If you don’t have any personal development books you can get them second hand on amazon to make them really affordable. Make the effort to read everyday at a time that is best for you and get into the habit of it. Create a reading list and go through the books, this will give you some time alone to look after yourself while learning and growing as a person. 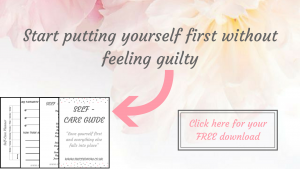 Again this is another free resource that is a great way to build yourself and learn more while spending time on yourself. You can listen to podcasts on Spotify, Apple podcasts and in loads of other places. Search for the topics you are interested in and want to learn about and find some that you love listening to. What self-care habits do you do? Which of these would you like to try? Join the community of supportive women over in the free group on Facebook and let us know how you get on. Awesome tips, I definitely need to try a few of these! Love this list! One of my goals for the new year is to make more time to read! Currently reading “Girl Wash Your Face” by Rachel Hollis…great read for personal development! I love this list! I definitely have a lot of work to do.. I need to focuse on drinking water and getting good sleep! It’s crazy how big of a difference these two elements can make! Also, I love the idea of listening to podcasts. It’s so underrated but it’s an amazing tool for self-care! Thank you for this great reminder! People (myself included) seem to forget to put themselves first sometimes!